The Scrolls lawsuit: Mojang 1, Bethesda 0? You can read more about my thoughts on the case more generally here. 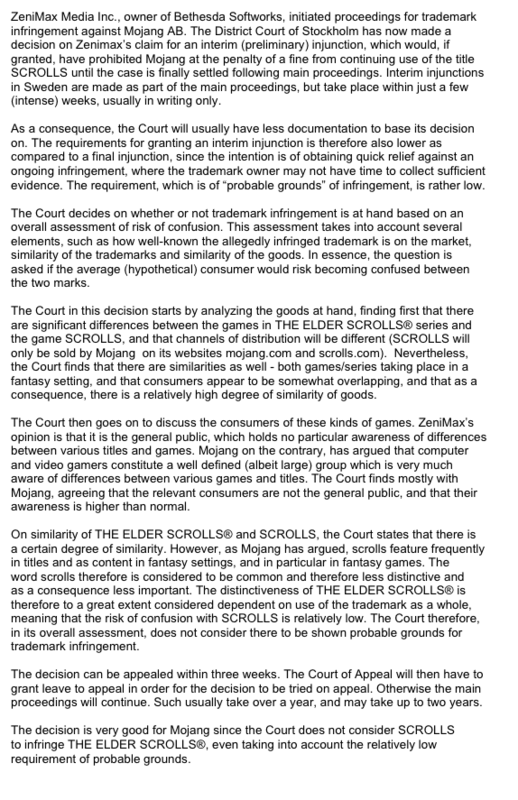 What happened since that post is that the war of words/legal letters between Mojang and Bethesda escalated into legal action by Bethesda, which is claiming that the forthcoming Mojang game ‘Scrolls’ infringes its trade marks in ‘The Elder Scrolls’. Specifically, they recently sought an interim injunction against Mojang. An interim injunction is basically a court order prohibiting the recipient from doing something for a period of time – typically for as long as it takes for the court to work out who’s legally right and who’s legally wrong in an underlying legal dispute between two or more people. In this case, Bethesda wanted a Swedish court to order Mojang to stop using the phrase ‘Scrolls’ in its forthcoming game, presumably until trial, when the court would be able finally to determine whether the game ‘Scrolls’ infringes Bethesda’s trade mark in ‘The Elder Scrolls’. In order to obtain an interim injunction, typically you have to persuade a judge that you have a good arguable case (sometimes you have to show that it’s likely to be a better case than the other side’s) and that you really need the interim injunction to prevent harm to your business (i.e. that being able to sue the other guy for financial compensation isn’t enough). I can understand why Bethesda wanted the interim injunction – if they didn’t get one, then quite possibly Mojang would have already released Scrolls before a trial even starts. However, theydidn’t succeed – I don’t have access to the full legal details, but it seems that for whatever reason the judge wasn’t persuaded by Bethesda’s legal arguments. (2) Continue with the lawsuit regardless. Ofc, neither option is brilliant for Bethesda I suspect. Regarding option 1, even if Bethesda is allowed to appeal the decision, that could take months – during which Mojang is entitled in principle to continue using the phrase ‘Scrolls’. As to option 2, Bethesda has been given an indication by the court that it preferred Mojang’s case to Bethesda’s – which is both a psychological blow as well as a legal problem if the lawsuit continues. However, in my experience I’ve seen almost as many lawsuits fight on despite the failure of an interim injunction or other tactical legal skirmish as I have lawsuits which have settled after the failure of one. A recent example in the games industry is the Bethesda v Interplay lawsuit over the Fallout IP, where Bethesda has persevered against Interplay despite more than one failed attempt to injunct (i.e. temporarily stop) Interplay’s development of a Fallout MMO. Of course, that’s not to say that Bethesda will definitely fight on – none of us know what will happen next. But the point is, legally they could fight on – maybe because they think there is still mileage in using litigation to protect their ‘The Elder Scrolls’ trade mark, maybe because they think all the PR damage has already been done to them, or maybe just for the principle. Personally, as a gamer, I love both Bethesda’s and Mojang’s games so I hope that a mutually beneficial settlement can be reached. However, unfortunately I think this case serves as a good reminder that – in the games industry like in all other industries – legal requirements and business sense, not personal sentiment, are what govern lawsuits. Hey Jas, great run down as always. I do have a question about the interim injunction though: this not being my area of law, in these type of copyright / intellectual property disputes do such injunctions tend to reflect, as you say, the preference of the courts towards one side's arguments? Just wondering as in areas I have more knowledge about where interim injunctions often occur (various public law and human rights law issues), interim injunctions and other such interim court orders often do not reflect the final outcome of the litigation. An obvious example currently would be the Dale Farm situation: the travellers secured a number of interim court orders to prevent Basildon council evicting them before the merits of the case were properly examined. The injunctions were used to prevent a party's rights being infringed before the court had time to properly examine the merits of the legal arguments – in the end, once properly examined, the travellers lost their case. Apologise for the double post, and also my inability to express myself properly after a long day: amongst the rambling, the question was meant to be more of "how far" (nice law exam phrasing) do such injunctions in general tend to reflect the strength of the respective parties' cases? Good question but no neat answers I'm afraid. As a general rule in my experience (at least under UK law), interim injunction results are a factor when it comes to trial – not least because the trial judge will have the opinion of a prior judge (or his own earlier opinion) to review. However, clearly by trial there has been much more evidence circulated, and further developments may have occurred since then, so there is always scope for something to change the judge's mind. That said, my gut feel is that it's relatively rare for a trial judge to decide that the earlier interim injunction was wrongly decided (if only because judges tend not to criticise other judges unless they can help it). As to your second question, as I said in the post, my feel is that I've seen about as many cases fight on despite an adverse interim injunction as I have those which settled. One last point – if a party had a genuinely strong case against another, they might accompany an interim injunction with an even stronger measure, like seeking summary judgment. Afaik, that hasn't happened here. Hope that helps! I am not a lawyer at all but this seems very interesting. I do have one question. I hope it isn't obvious or silly. In your earlier post on this subject you mention that in order to keep a trademark you have to try to enforce it. You mention Hoover as a company that lost its trademark because of lack of protection. Does that mean they have to win the case or their trademark is weakened or can they preserve it just by fighting the case? In other words, if we assume that Bethesda is only going through this lawsuit in order to put up a fight for the sake of protecting their trademark can they walk away at this point and say, "Well, we tried" without weakening their trademark? Patrick – that's a really good question. I'm afraid the answer is that at a minimum Bethesda have to take action to protect their trademark. If they lose, then there is the potential for it to harm their trade mark (obviously if they win, it won't cause harm). Therefore, I don't think there's much prospect of Bethesda saying "well, we only started this so we can say we started it, but really we don't want to fight". Hope that helps.